Enjoy 10% discount on all food, drinks and ice creams from Farmyard Cafe when you book saver tickets online. Quote code GY2019. Terms & conditions: Valid until 31 December 2019. Not valid in conjunction with any other offer or promotion. Photocopies not accepted. Saver tickets must be purchased online quoting code GY2019. On Junior Farm, our littlest visitors will love to follow the Easter trail. Don’t miss the Barny & Bella Show with singing and dancing fun with our Junior Farm mascots – make sure you get a “selfie” to show your friends. Our hungry lambs are growing fast and the team would love your help with their daily bottle-feeds, still leaving plenty of time to say hello to all our other friendly animals and join in with our daily programme of Junior Farmer activities. The Family Funpark will be open daily from 11am for the loudest whoops and giggles as everybody has fun - ride the Dizzy Caterpillars and Jumping Frogs, whooosh down the giant slides, take a trip on the train, steer our remote-control cars and boats, compete on the aquablasters and maybe even take up the challenge on our 18-hole Championship Mini Adventure Golf course. A visit to the Made By You studio is great fun for craft-lovers of all ages – everybody loves to have a go and make something totally unique for Easter in decopatch, sand art or pottery painting. Go to our website and save £££s when you book Super-Saving Combo tickets online at just £15 per person during the school holidays. 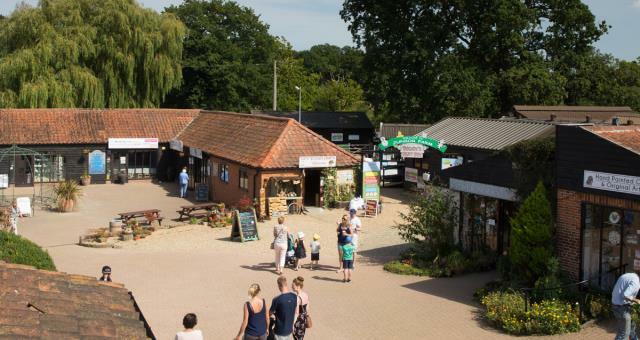 Come and go as you please all day on Junior Farm and enjoy the Funpark and Mini Golf too – and Combo Ticketholders can ride the Wroxham Barns train as many times as you like. (Please note that token-operated rides and attractions are not included in your Combo ticket). Junior Farm Season Ticket holders can purchase a half-price Funpark Top Up Combo ticket. PLUS, Combo Ticket holders get 10% off all purchases at the Farmyard Café on the day of your visit, serving Barista coffee, cakes, jacket potatoes, sandwiches, pastries and so much more – perfect for a pitstop or light lunch. There’s plenty of seating both inside and on the outdoor Terrace perfect for when the sun is shining (and covered if it’s not). The perfect Easter day out at Wroxham Barns! Please note that the Family Funpark opens at 11am daily. Free parking and free entry at Wroxham Barns. Pay only for your choice of activities. Junior Farm entry is £7.95 during school holidays and allows visitors to come and go all day as they wish. There are no extra costs for activities on Junior Farm. Under 2’s and Season Ticket holders are free. Our Funpark is now operating the new Fun Pass. Obtain a card at the kiosk with a refundable £1 deposit and top-up credits as you wish. Or keep your card and register it online for a 20% bonus on all future top-ups.